I read this article and found it very interesting, thought it might be something for you. The article is called Restaurant Review: Ukiyo Lounge and is located at https://www.totallydublin.ie/food-drink/food-drink-features/restaurant-review-ukiyo-lounge/. I read a lot of menus, not necessarily because I am required to, or because I’m sitting down to dinner; I read them for pleasure. The menu is the dirty talk that precedes the foreplay of the appetisers – or the bread service if you’re eating fancy. They are the fore-foreplay of eating out, if you know what I mean. Perhaps I should have gone with dining out. They lean in and whisper what they are going to do to me and I am tumid with expectation. This is the point of well written menus: to make promises. Badly written menus are simply lists of options; good restaurants make good on their promises, they put my mouth where my money is. When a menu box appeared some weeks ago underneath the neon sign denoting the entrance to the all-new Ukiyo Lounge on Dame Court, I was transfixed like a pervert at a peepshow. This is a menu that promises to do many things to me. Japanese things. Ukiyo has been slinging entry-level bento boxes (and facilitating the murder of song) on the corner of Exchequer Street for what feels like forever (it has been fourteen years). The food was never going to transport you to downtown Daikanyama, but it has always been affordable and doesn’t take itself too seriously in terms of provenance or authenticity. The dishes that come out of the kitchen are probably as good as they need to be for a joint that is also a karaoke spot and ‘late nite’ bar. The charming floor manager actually tells me that a lot of the club regulars don’t even know that there is a kitchen. They presumably make do with eating their own faces into the wee hours. In what must have been a gargantuan task the owners have connected the karaoke area in the basement of the original restaurant with a cavernous subterranean space in the old CHC (Central Hotel Chambers) building. On a recent sunny Thursday evening, I descended into the bowels of said building with Red in tow. She is immediately displeased by the plastic LED jellyfish hanging from the ceiling. I decide to keep my displeasure in reserve for more important considerations. Their website describes the place as ‘our new 75-seat restaurant, lounge and club’. It feels like at least two of those things. Where you might expect to find a host station there is a makeshift DJ booth where we wait too long to be invited to a table. The room is vast with a backlit bar running the length of the street side, and the windows above it don’t admit a lot of light. 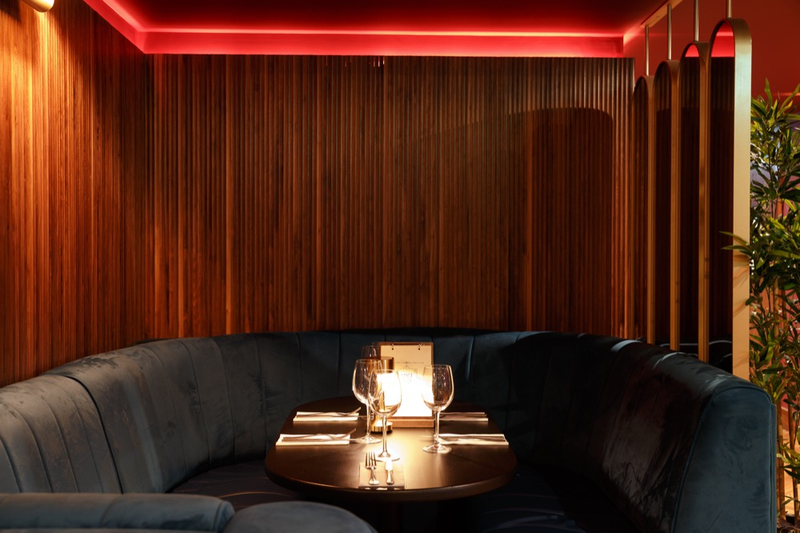 You will want to be seated at the banquette that runs along the left of the room, rather than marooned in the sea of fake parquet at one of the standalone tables. We order liberally from a menu of small plates ‘designed for grazing and sharing.’ First to arrive is Tempura Halibut with Ponzu Mayo. The fish is startlingly fresh and flavourful but the batter has none of the brittle snap and rustle that tempura demands. Maybe it sat on the pass too long. The mayo is good. Next comes Beef Tataki with Black Truffle Oxtail Vinegar. Four slices of rare fillet beef are lined up on a rectangular dish topped with ‘soy caviar.’ It’s a fine plate of food, but the meat has been rubbed with something spicy (perhaps togarashi) that bullies the vinegar (in gel form) into the background. At this point a party – the perfect collective noun – of braying berks arrive to occupy the large circular table at the rear of the room. They are overdressed in that way that people overdress when they are celebrating something. Neither of those things is restraint or good taste. 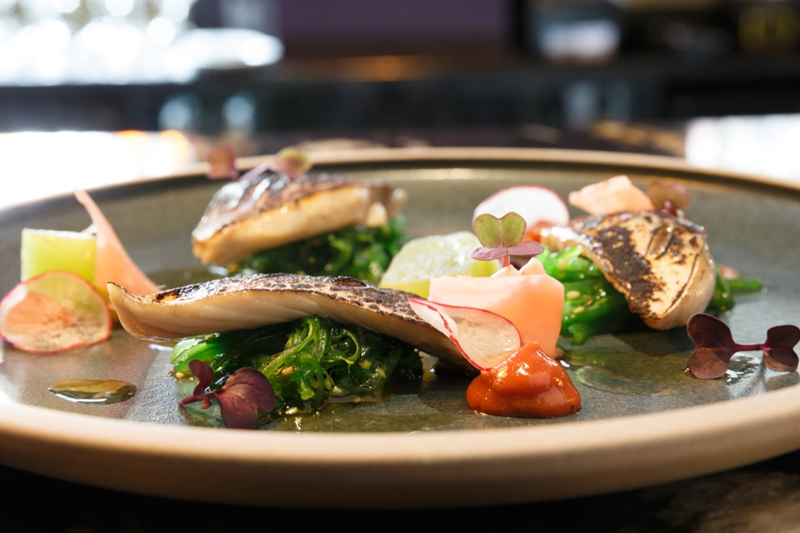 Good taste is also absent in the Marinated Mackerel with Wakame and Rhubarb ‘Mustard’. The fish is limp and yielding, and tastes only of the blow-torching it received before being sent out. I like the mustard. Pork and Chive Gyoza are perfectly fine. 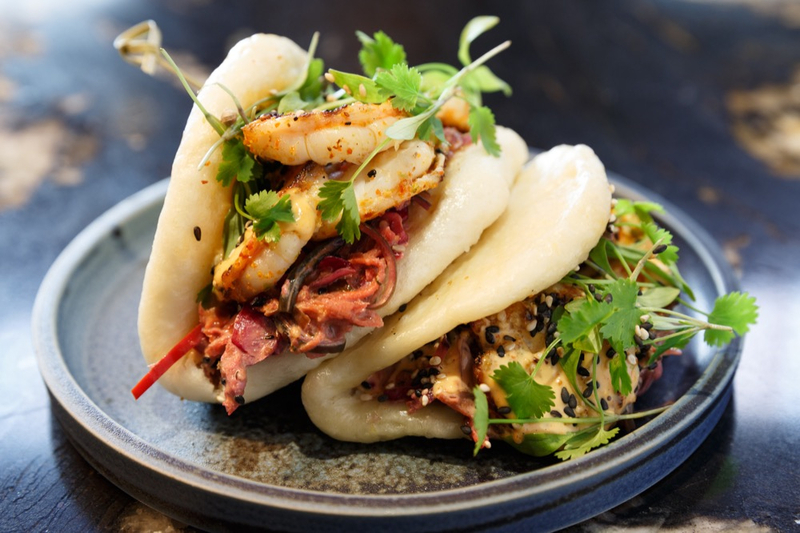 Korean Bao with blackened shrimp are let down by a lank slaw. Salmon Belly Yakitori with liquorice teriyaki just doesn’t work. Service is competent and knowledgeable, and the cocktails look good even though we stick to well-priced flasks of house sake. After eleven bells, the tables and chairs are cleared away and the space is given over to pre-coital gyrations, or, for those less fortunate in the DNA lottery, just regular dancing. At the end of the day, you are dealing with a space that becomes a club at the end of the day, so the space was never really going to feel like a dining room. I feel like some promises have been broken, but, in the kitchen’s defense, it is a new menu and I haven’t given them a lot of time to work out the kinks. As we pass that menu box on our way out, I comment that the menu still reads beautifully. “Paper never refused ink,” replies Red.